More than two years ago, when Bollyviewer hadn't yet deserted the cold climes of the northern hemisphere to settle for hot Indian summers, she and I watched quite a few movies together. Well, 'together' is a just a turn of phrase in this Internet age. We 'watched along', she in her apartment and me in my house, and chatted on Google about the movie (and other things) while we watched together-apart. So one day, we set a date and time to watch a Dev Anand movie, and decided, after much deliberation, on Kala Pani. And when the day and time came, we ran into a hitch. Bollyviewer's (henceforth BV) downloaded video wouldn't play. While we were contemplating which other movie to watch, the discussion veered off, as all our conversations do, you will find, into the uses of iPhones (not to talk, but to text and check your email in the loo - as per BV) and Excel sheets in which to chronicle all your DVD purchases. 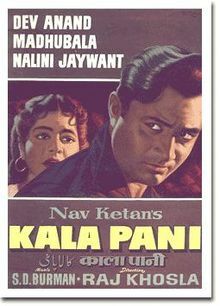 Eventually, BV managed to track down a DVD of Kala Pani, which she'd forgotten she had, and we settled down to watch. BV: The guy really doesn't deserve a son with such a perfect puff! Soon, we learn that Shankarlal is innocent. However, no one had believed him, not even his wife. Ramdas, who owned a shop near where Mala lived, was the only one who believed Shankarlal was innocent, but his evidence had not been accepted in court. Karan promises his father that if Ramdas is alive, he will have the case re-opened and get his father released. Shankarlal finally unbends enough to appreciate his son. BV: Ah, finally the father appreciates DA's beauty. Now that's what I call true bonding! Karan makes his way to the locality where Ramdas used to own a grocery store. He finds Ramdas there, alive and kicking and not at all interested in digging up a 15-year-old murder case. However, he is not unkind; he asks Karan to return after the shop closes for the day. Instead of waiting around until night, Karan decides to visit the town newspaper. He wants to read up on the reports of the crime. He's directed to a Ms Asha (Madhubala), who appears to be busy on the telephone. (When she turns and he sees her face - ooi ma!) But he manages to collect himself and tell her why he's come; he wants to look at newspapers from 15 years ago. She sends the office peon to take him to the newspaper morgue. 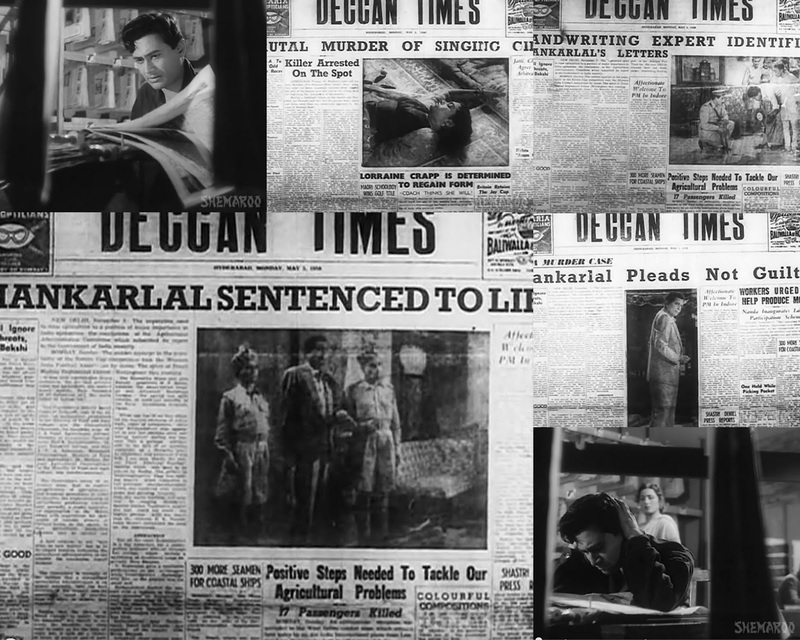 Karan finds the story, which appears to have been front-page news at the time. The more he reads, the more dismayed he becomes. Finally, not having got any further in his investigation, he sets off to keep the rendezvous with Ramdas. Once he's clarified why he's interested in an old murder case, Ramdas tells him what he knows. Fifteen years ago, he had been sitting in this very shop, when he had heard a girl scream in the brother upstairs. He had run up the stairs to find Shankarlal standing over a girl's dead body. Then, as Ramdas had watched, horrified, Shankarlal bent down and picked up a knife that was lying on the floor next to the dead girl. Ramdas emphasises this point - Shankarlal picked up the knife after Ramdas arrived. Then, the police arrived and Inspector Mehta (Nasir Hussain) questioned the witnesses. Kishori (Nalini Jaywant) had only pointed to Shankarlal, she hadn't said anything. He, Ramdas, told the inspector what he had seen, but Jumman (Krishan Dhawan) had put in his own two paise worth. When the police searched the place, they had found letters that tied Shankarlal to Mala. The next day, Ramdas had recorded his statement at the police station. He had reiterated it in court as well. But Kishori and Jumman both swore in court that Ramdas was as blind as a bat without his glasses, and that he wasn't wearing them when he came up to the kotha on the night of the murder. Ramdas' deposition was struck off. Karan dejectedly returns to the guesthouse. (It is owned by Asha, the young woman he met at the newspaper office, and is managed by her aunt [Parveen Paul]). The next day, Karan goes to meet ex-Inspector Mehta (Nasir Hussain) at his residence. There, he requests Mehta to help him; he is sure that his father, Shankarlal, is innocent of the crime of which he is has been convicted. He's trying to find evidence to prove his father's innocence. Mehta is more than happy to help; for 15 years, his conscience had been bothering him. He knows Shankarlal is innocent. For, after he had arrested Shankarlal, he had begun investigating the murder. One day, he had been called into his superior's office; the public prosecutor, Jaswant Rai (Kishore Sahu), was present as well. The latter had wanted to know about Mehta's investigations. Mehta had informed them of his discoveries: a drug bottle next to Mala's corpse that belonged to neither Shankarlal nor Mala; the post-mortem report, which had stated that the blow that killed Mala had been struck by a left-handed person - Shankarlal was right-handed. The prosecutor had pooh-poohed all of Mehta's 'evidence' and summarily dismissed him. The case went to court; evidence was given and Shankarlal was condemned to life imprisonment. When Mehta exited the courtroom however, he had overheard a conversation between Jumman and Kishori, from which it was clear that Shankarlal was framed. It was also clear that Kishori was in possession of a letter that not only incriminated the real murderer, but also absolved Shankarlal of blame. He was, Mehta says in hindsight, both selfish and cowardly - he hadn't reported the new evidence. However, he has a piece of advice for Karan; Kishori is now Hyderabad's most famous courtesan. If he can get the letter from her, it will help clear his father's name, and set him free. Back at the guest house, Karan asks his room-mates for help. Do they know where Kishori lives? His question sets his room-mates afire. Kishori? Haai, haai, doesn't Karan know that it is not easy to visit Kishori? Men can't just walk in there. It is the sort of kotha where the guests are welcomed with paan, and if they can't drop a hundred-rupee note into the plate, they will have outstayed their welcome. Karan is taken aback; he has just about enough money to pay the rent, but it is important that he meets Kishori. Badru knows another way - courtesans like Kishori have a weakness for more than money - a good-looking face, a great voice, a talent for poetry will gain him admittance. Karan has the first two, and Madhosh mian promises to provide the third. All Karan has to do is to learn a few of his ghazals. What about looking the part, though? Badru and Daulat Khan make up the lack of a shaayarana libaas (a poet's outfit). With the help of his new-found friends, Karan gains admittance to his first sight of the famed Kishori. While all her other guests appear besotted by her beauty, her song and dance, it is clear to her that Karan is not impressed. Intrigued, she keeps him back, only to be told that while he could compliment her beauty and her voice, as a poet, he could hardly compliment the lyrics of her song. Taking up her challenge, he proves that he can entrance her with his words. He then takes leave of her, promising to return the next day. Slightly intoxicated by the drinks that Kishori had poured for him (and that he had drunk to keep up his pretence), Karan stumbles into the wrong room at the guesthouse. (For someone who is so rudely interrupted from her sleep, Asha seems a tad bit too comfortable with a strange man's presence in her room.) Perhaps it is the liquor but Karan is more forthcoming than usual, and Asha is happily compliant. They part on excellent terms. It is only the next morning when she hears about an irate guest demanding to know where his achkan and topi went that she suspects something is seriously wrong. Being an intelligent girl, she quickly puts two and two together and goes off to set matters right. Karan makes his way back to Kishori's kotha in the evening. It is clear that Kishori is falling under his spell. It appears that Karan is not as detached as he seems - he proposes to Kishori, who is shocked. She begs him not to trifle with her, but he convinces her that he is serious. When Karan returns to the guesthouse, it is to see Asha asleep on a chair; she had been waiting for him. It is equally clear that Asha is in love with him, and now it appears that Karan is in love with her as well. Indeed, he asks her to return to Bombay with him. Karan is definitely playing both ends against the middle here, and he continues to meet Kishori, confessing to her that he doesn't have the means to support her in the style to which she is accustomed. Kishori has already promised him that she will leave the kotha once he's married her; now, she tells him that he's never to worry about money. She has another means of income, something precious that will ensure that they never have to worry about money again. Not knowing that Asha has seen him with Kishori, Karan goes to meet Mehta. His deceit is beginning to gnaw at his conscience. Kishori is in love with him. He is her hope for freedom. Mehta is furious - is her life more precious than his father's? His father too is pinning his hopes of freedom on Karan! Has Karan forgotten that it is thanks to Kishori that his father is in jail? Upon Karan's insistence on knowing whether the letter will be enough to clear his father, Mehta promises to take him to meet the prosecutor in the morning. When Karan meets Kishori again, there is an air of melancholy about her. She makes a couple of oblique remarks that he doesn't understand. After that evening's performance, she makes it clear that she knows why he pretended to love her. Her voice is cutting - Karan is even lower than those men who bargain for her favours; they, at least, do it openly. He? He pretended to be in love with her, promised to marry her, for what? This letter? Karan is furious, partly because his conscience bothers him. Who is she to talk of justice when, for a few coins, she had sold his father into imprisonment? Her quick remorse softens him, however, and he leaves with a better understanding of why she did what she did. Kishori, in turn, hands him the letters - it's all she can do to make reparations. BV: From two girlfriends, he's gone into the minus counts. Lawyers whom he and Mehta approach are not very optimistic either. Yet, Karan refuses to give up. His room-mates, Madhosh mian and Daulat Chand, who have been thrown out of the guest house for not paying their dues, merge forces with him to hold a dharna in front of the prosecutor's house. Badru, who has lost his job supporting his erstwhile roommates, also joins in. The crowd that originally mocks Karan, is swayed by his arguments, and joins him in the protest. A Deccan Times press photographer is passing by, and sensing a story, takes a quick photograph. While Jaswant Rai is asking for police intervention to disperse the crowds, the photographer goes to Asha - there's a story here, a front-page story. Asha is intrigued; she remembers that Karan had initially come to look into the newspaper archives. She goes to the prosecutor's house only to find no one there; a passerby tells her that Karan has been taken to the police station. This being his first offence, he's left off with a warning. The next morning's newspaper is sizzling with the news. Jaswant Rai is apoplectic. How dare they write a story about him without a shred of evidence? He threatens the editor (Bir Sakhuja) with a lawsuit for defamation of character. The editor is furious with Asha - publishing such a story without any evidence to back it up is bad news for him, his paper, and his reputation. With Asha's help, Karan had mobilised the power of the press to further his fight for justice. Now that is shut down. So too are police and even legal avenues. His only piece of evidence was burnt before his eyes. Where is Karan to go now? Who can he ask for help? Who is the mysterious man behind the crime? Based on AJ Cronin's Beyond This Place, Kala Pani was an intriguing film, fast-paced, well-scripted, and sensible. (There was a Bengali film Sabar Uparey that was also based on this book.) Characters actually spoke to each other; secrets were never allowed to fester; the hero never shifts from his quest for justice; romance happens quite by chance, and the leads take it in their stride. There isn't even a romantic duet. Just like in Kala Bazar, I kept thinking, 'How refreshing!' quite a few times. People who actually behave sensibly? A man who actually tells the woman he loves the truth? A woman who actually believes him? A couple who talk to each other? Unbelievable. A hero, encouraged into stupidity by someone with an axe to grind, who is still sensible enough to listen to the man (the villain is a practical chap - kill me, and you can't set your father free) who's responsible for his father's imprisonment? (It didn't hurt either Bollyviewer or me to notice that Dev Anand looked incredibly handsome in an unbuttoned black shirt.) A villain who confesses? 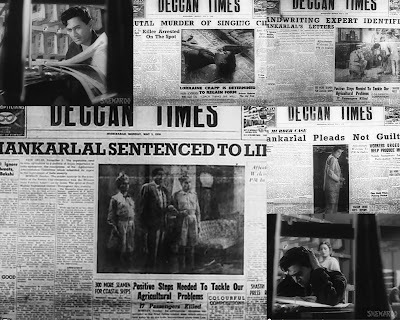 Having learnt under Guru Dutt, Raj Khosla's song picturisations were also shot beautifully, Khosla using each song to further the plot along, none inserted gratuitously into the narrative. A scene before one song sequence shows us that Mukri sings rather well; what's surprising is hearing Dev sing a few lines of Nazar lagi raja tore bungle par. The man can hold a note! 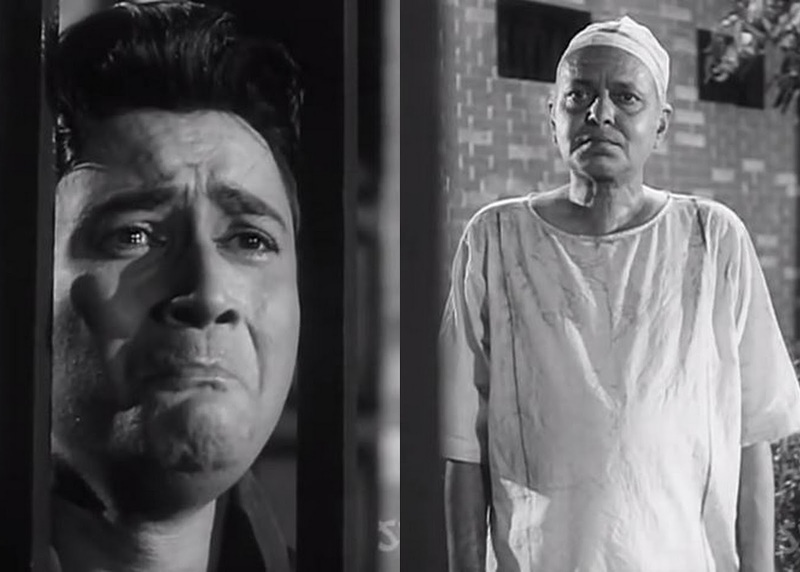 Like many of Dev Anand's earlier characters, Karan too is morally ambiguous. Though he feels a slight distaste at making a woman fall in love with him, the ends justify the means. As a son who discovers by sheer chance that his father is not dead but imprisoned, he turns in a restrained performance without much of the mannerisms that became a part of his repertoire later. He won the Best Actor award at the Filmfare Awards that year. His romance with Asha was also downplayed. They fall in love with each other quite naturally, and there is a level of trust between them that does not allow misunderstandings to fester into resentment. So even when Asha comes to apologise, it is in a playful, non-apologetic manner. Nalini Jaywant had a finely nuanced role as the prostitute who not only bears the blame for an innocent man being framed, but also falls in love with that man's son, and hopes for a life better than the one she is used to. When she learns that he was using her, her hurt despair gives her a certain dignity and self-respect. When she finally finds her path to redemption, she is not only giving up a constant source of income, she is also making reparations for the sins of her youth. It helped that she is not asked to die in the end. Nalini Jaywant effectively brings across this dichotomy in her character, and one can see the character grow before one's eyes. She also appears to have put in a lot of effort into the dances, choreographed by Lachchu Maharaj, gracefully executing the Kathak steps. 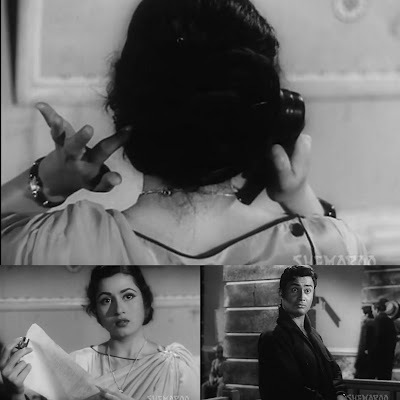 Madhubala. Beautiful, she definitely is. Here, she's given a character who's more than a cipher, though she has a smaller role than Nalini Jaywant's. (She gets only two duets to Nalini Jaywant's three solos, only one of them a playfully romantic one.) Madhubala's Asha is a working girl. She is intelligent, resourceful. She knows what she wants, and she knows how to get it. (The scene where she pays Karan's rent, for instance.) There is no false modesty here - her love for Karan is obvious, even when she doesn't voice it. While she suspects Karan of infidelity, she actually listens to his explanation after she cools down and gets a chance to talk to him. Later, when she is asked to stifle her voice at work, she takes matters into her own hands, risking her job to do so. It does one good to see a working woman in Hindi films, not as a 'Look, she works!' 'modern' woman, but just as a part of that character. It's nice to see a mainstream heroine who is there to do something more than sing and dance. Finally, it was nice to see a film where though the hero gets to do a bit of dhishoom-dhishoom, it's the heroines who save the day. I was left with a couple of mysteries to solve; I don't know if it was our copies of the DVD, or whether the film left these questions unanswered: How did Kishori know that Karan was only pretending to love her? What was Shankarlal's connection to Mala? Why was he there at the scene of the murder? Why is it incumbent on Shankarlal's wife to accept him when she left him because of his affair, and not because of the murder? We are never told. My Dev Anand marathon continues, and unlike a lot of other old films, I find I can still watch these. More to come, ladies and gentlemen, toh dil thaamkar baithiye. I cannot say 'Isi din, isi samay' but if you want more Dev-love, you know where to come.